Game studios listen up, this is how you do remakes! Close to 13 years ago, the masterpiece title Shadow of the Colossus released on the PS2 and the gaming world accepted it with open arms and rave reviews. Coming from Team Ico and Fumito Ueda, Shadow of the Colossus was deemed as the spiritual successor to Ico and rightfully so, it captured the tone and feel of the game with phenomenal results. Releasing for the PS4 on February 6, did the remake stand the test of time and can it still be considered as one of the best games in the Playstation library? YES and YES. Shadow of the Colossus is every bit as great now as it was before and with the game built from the ground up to take full advantage of the power of the Playstation 4 Pro, you can now enjoy this epic masterpiece in 4k or at 60fps, ways the game was meant to be played. The premise of the game is simple, you’ve entered a forbidden place in search for a way to restore life to a young maiden. You find out that in order to do so, you need to defeat 16 colossi in order to complete the process. Thus, the adventure continues and boy what an adventure you’ve just gotten yourself into. Armed with nothing but a few tools and your wit, you must exploit the weaknesses of each colossi and figure a way to get to it and beat the boss. Your trusty ancient sword will guide the way to where you need to go throughout the vast expanse and will even show you where the weak spots on the colossi are, so get yourself acquainted with how to use it asap. What else? That’s it. The game is very direct, which means there isn’t really anything else to do other than beat the boss and move on to the next. No side quests, no stat allocations or upgrades, no crafting, nothing. If you’ve been used to all these small things here and there to fiddle with, you’re not going to find them here. Instead, it’s just you and 16 bosses. 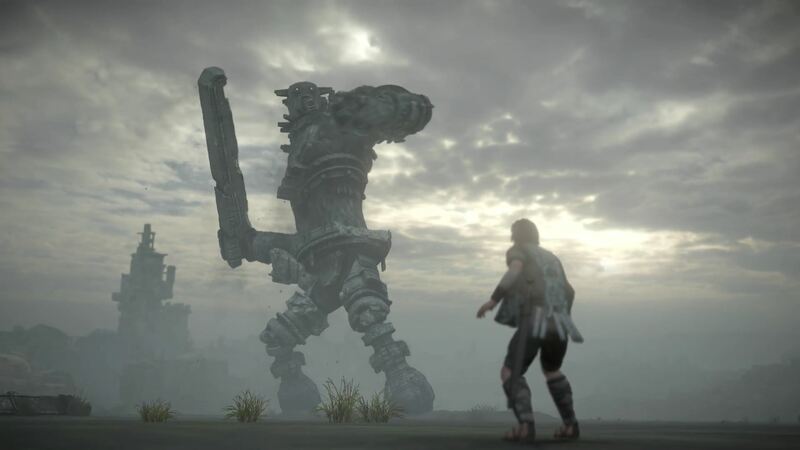 These bosses can range from the downright easy to a complicated mess, but it’s all in good fun and the feeling of satisfaction you get from beating these colossi is captured beautifully and is a shining moment in this game. There are quite a few modes that you can unlock by finishing the game and for the “speed runners” out there, you’d be pleased to know that there is a time attack mode for you to clock in your colossi takedowns in record time. You can also unlock a few pieces of equipment that will help you in succeeding playthroughs but we’ll leave these for you to uncover. While it all seems simple enough, there is a grip mechanic kind of complicates things a bit since it will only allow you to grasp on to ledges and walls for a limited amount of time. This makes the game feel well thought out and makes all of your actions very deliberate and cerebral, as it should be. You don’t go into a battle with a colossus armed with next to nothing and expect to come out alive without plotting a strategy. The meat is in the preparation and the execution follows suit and when pulled off, is a great feeling that cannot be overstated. Speaking of execution, the controls of the game are also really good although there was a small number of times that I wish that the camera angles could have been better but I’m really just nitpicking because overall, the control scheme for Shadow of the Colossus is leaps and bounds better than what The Last Guardian tried to do but failed miserably. The photo mode is the best way to cap things off for the game. Utilizing the power of the PS4 Pro, the scenery of the game is a sight to behold. Whether playing at 4k or at 60fps, this game is simply breathtaking and is one of those games that you really just stop at times and enjoy the view, while using the photo mode to full effect. You can tweak camera angles, add filters, change focus range, and much much more! All these tools are at your disposal and in combination with the massive colossi housed in their domains, it can make for truly dramatic and instagram worthy pictures. The game is great, but the graphics just push it over the top. More than 4k, 60fps is a DREAM. The satisfaction of downing a colossus is palpable. If you’re new to the game, the control scheme might take getting used to. Shadow of the Colossus is living proof that you don’t have to have the best graphics or the most well known character to make a great game. In this case, solid mechanics and wonderful gameplay make up what is arguably one of the best Sony Playstation games of all time. It helps that the game looks stunning on the PS4 pro, so do yourself a favor, GET THIS GAME and let it take your money. Shadow of the Colossus launches worldwide for the Sony Playstation 4 on February 6 so make sure to prepare yourself to drop cash for this, trust me it will be worth every penny. Or centavo. The Shadow of the Colossus remake is every bit as awesome as you would hoped it to be. From the game design to the haunting soundtrack, Bluepoint games did such a fantastic job on this faithful recreation of the game that fans and newcomers alike will enjoy such a spectacle. Next articleRUMOR: Fans Rejoice! Some of your Favorite Overwatch Voice Actors are coming to the PH! (WATCH) UnGeek Plays: The Park (Final) – THE TRUTH REVEALED!